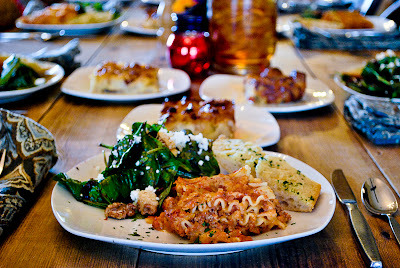 Lasagna is a popular lunch choice for small business retreats at the Inn Above Onion Creek Bed & Breakfast. We're also offering it for take out as well. Click here for additional details on ordering take out Lasagna or Settler's Pie for you next party or event. Our Chef likes to use Mom's beef, which is raised a few miles down the road by Sharon Michaelis. 1. Season the beef with salt and brown in a skillet. Drain the fat and set aside. 3. Add the tomato and tomato paste. Simmer for 10-15 minutes and salt to taste. Add the herbs and browned beef. Simmer for another 10-15 minutes, and season to taste if necessary. 4. Grease a deep, square baking dish and add a layer of the meat sauce. Cover sauce with a layer of pasta. Spread a layer of ricotta over the pasta, and sprinkle mozzarella, parmesan, and pecorino over the ricotta. Continue to layer the ingredients in that order. End with a layer of tomato sauce. Reserve a layer of mozzarella Cover with foil and bake in a preheated 350 degree oven. Bake for 30-45 minutes. Uncover the lasagna and add the remaining cheese. Bake until the cheese is bubbly. Let the lasagna cool for 10-15 minutes before cutting.